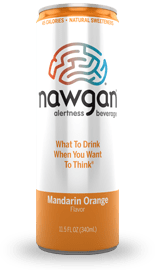 Partially inspired by the movie Iron Man 3 and partially due to this summer’s hot weather, I’ve chosen Nawgan Mandarin Orange as the Energy Drink of the Month for July 2013. For any caffeinated beverage, the following 10 attributes are key to assessing the drink’s potency and value. Let’s go through this exercise with Nawgan’s Mandarin Orange. This is amount is less than the amount of caffeine in a tall iced coffee from Starbucks (120mg). One serving is one whole can, which makes it easy to regulate the amount of caffeine one consumes. This product has a Nutrition Facts panel, which means it’s a beverage, not a supplement. That means this product is subject to food/beverage regulations, not the supplement regulations (What? Supplements are regulated? Yes, despite what you may here elsewhere, supplements ARE regulated by the FDA, just using a different rule book than the one used for food/beverage products). Since this has a Nutrition Facts panel, you know all the ingredients used within are either GRAS (Generally Recognized As Safe) or approved food additives. Since this product is a beverage, not a supplement, it’s unusual to find Recommended Usage or Warning information. Some caffeinated beverages still bear the Warning Label, but this beverage does not. With only 100mg caffeine, this isn’t surprising. The first ingredient in this product is filtered water, not carbonated water. Carbonation irritates the stomach lining which speeds up the absorption of certain molecules like alcohol and caffeine. This is why champagne seems to affect one’s sobriety more rapidly than beer does. This product has 11 grams of added sugar so those of you watching your sugar intake may want to opt for the sugar-free Nawgan products. This product also has Erythritol, a sugar alcohol that’s captured the interest of food scientists for its reported ability to improve oral health. Notably, this product is also sweetened with Stevia, not any artificial sweeteners. Vitamin B-12 plays a key role in maintaining healthy cells and DNA throughout the body. This product has 50% of the Daily Value of B-12, a respectable amount. There is no known upper intake level for B-12, meaning you can’t ever have too much, but there’s no reason anyone without a clinically diagnosed B-12 deficiency or absorptive disorder needs over 100% DV in one product. Vitamin B-6 participates in over 100 chemical reactions in the body, most of them involving amino acids and proteins. This product has 50% of the Daily Value of B-6, which is a good amount. A deficiency in B-6 makes it harder for blood cells to carry oxygen properly, so it’s important to get enough of the vitamin every day. However, intakes over 100 milligrams ( 5,000% DV) can cause nerve damage. 9. FOLIC ACID – This product has no folic acid, which isn’t a bad thing at all. It would only be bad if the product had more than 100% DV folic acid because that could mask a B-12 deficiency. 10. NIACIN – This product has no niacin, which isn’t a bad thing either. It would only be bad if the product had more than 35 milligrams of niacin (175% DV) because that could bring on the “niacin flush” – symptoms of flushing and itching. The amount of caffeine in this product and the lack of carbonation make this product a good match for Fatigue Level 3 (Read more about the 5 Levels of Fatigue in ARE YOU A MONSTER OR A ROCK STAR: a guide to energy drinks). This drink is perfect for those mornings when a cup of tea or a glass of water isn’t enough to wake you up, but you don’t need a high-powered shove of caffeine to push you through an all-nighter or a graveyard shift. Moreover, whether or not this citicoline brain-booster actually works, the drink is energizing, sweet and refreshing – perfect for a hot summer day.